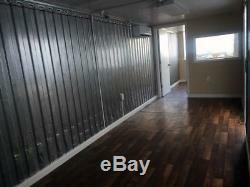 320 sq ft 40' x 8' x 9'6 refrigerated container converted to a tiny home or office. 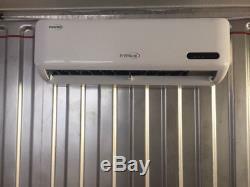 Central air conditioner Wired ready for your generator or 220v pole electrical hook up Painted stainless steel outside will not rust. Food Grade Stainless Steel interior. 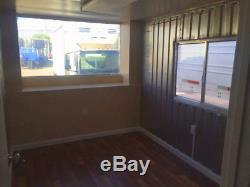 3" insulated walls 4" insulated roof and floor special urethane insulation highest R value. Structural Insulated Panel Walls (SIP) Fully customizable simply screw shelves cabinets to stainless. 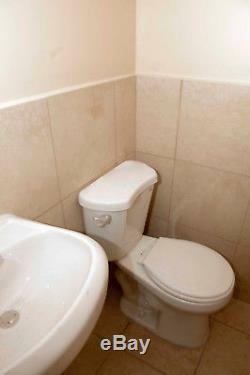 2 bathrooms with sinks one accessible inside one accessible outside. In Office configuration it has two bathrooms one for workers and one for office The one bathroom can be converted to shower accessible from inside. 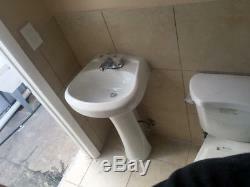 2 working toilets 2 working sinks. One can be converted to a shower easily. 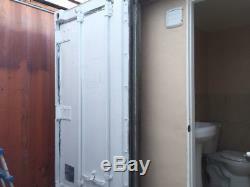 It's a Hi-Cube 40'x8'x9'6 refrigerated container conversion so it is insulated well. We replaced the space left from refrigeration unit with impact Acrylic glass picture window. Below that a high efficiency central split unit A/C Plywood floor over stainless steel I-Beams with laminate wood flooring. Wired with a regular 220v junction box outside with inside 120v plugs and fluorescent lighting throughout. 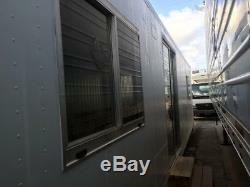 Perfect for food service mobile kitchen. Simply hook up electricity and water and you have a clean cool insulated space to work or live. Ask me anything about it me anytime 8am to 10pm Eastern time. This is the starting price can build to suit. 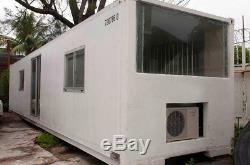 The item "SHIPPING CONTAINER HOME TINY HOME HOUSE OR OFFICE WIRED PLUMBING A/C INSULATED" is in sale since Tuesday, October 17, 2017. 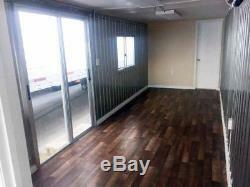 This item is in the category "Business & Industrial\Material Handling\Shipping Containers". 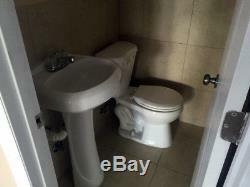 The seller is "sobeinfo" and is located in Miami, Florida. This item can't be shipped, the buyer must pick up the item.